Thuong Duc (A-109) was the A-Camp closest to DaNang - approximately 37 kilometers (which we called "clicks.") or just over 22 miles west. However the camp blocked a major infiltration route and consequently seemed to always be under attack. The first I knew that Thuong Duc was in trouble was when my OIC (Officer in Charge) came to me and told me about the situation. Thuong Duc sat in a valley with high mountains on each side. The NVA had AA (anti-aircraft) weapons on the mountain ridges above the valley. Consequently, they could shoot down at aircraft trying to use the runway. The Air Force refused to risk any more aircraft in re-supply attempts. The camps defenders were getting very low on food and I had rice, lots of rice. 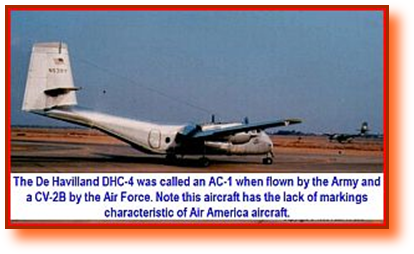 I also had Air America (The CIA's private airline), not bound by Air Force regulations. I was asked if I thought I could get my Air America friends to fly me in there with a load of rice. I'm sure my OIC was thinking about a conventional low-level extraction cargo delivery or landing. I had two things going for me that he had not considered or, most likely, was not even aware of. I was an avid and experienced skydiver and I had been trained as an Army parachute rigger even though I had not made an airdrop since rigger school. I was not going to ask my Air America friends to fly a suicide mission that the Air Force was unwilling to do. But I was SF and one of the traits SF recruiters looked and tested for was creative problem solving - thinking out of the box. This was long before these ideas hit the corporate world. This is one of the things that made us unpopular and in many ways unsuitable for the regular Army. I have not yet been able to find suitable maps from which I can determine the elevations of the camp runway and the surrounding mountains. When I find what I need, I'll be able to better refine this anecdote. I decided that I was going to free-fall the cargo into Thuong Duc from above the mountain tops north and south of the camp. Air America allowed me 5,000 pounds of cargo. That would be five-1,000 pound pallets of rice. I obtained the gear I needed from our rigger shop (I assume, since I can't even remember having a rigger shop.) The rice was secured to the pallets in the normal way with steel banding. Webbing was then used to further secure the load and provide attachment points for the cargo parachutes. Each pallet had its own cargo chute (nomenclature and size escape me now). The risers (webbing that goes from the suspension lines to the load) were attached to the loads and the parachutes tied down. 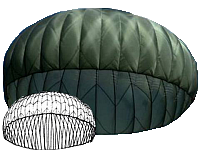 In a normal airdrop, the bag containing the cargo chute would have a static line on it which would be attached to a steel cable inside the aircraft. To drop from a high altitude, that would have to be one long static line. Instead, my cargo chutes were connected to drogue (very small) parachutes which were attached to the load and the static lines were attached to these drogue chutes. Since the pallets would be falling without parachutes they would need the drogues to stabilize them - keep them from tumbling. And I would need something to act as a pilot chute (air anchor) to deploy the main cargo parachutes. I rigged the load based upon my training as a rigger and determined drop altitude based upon my experience as a free-falling skydiver who deals with jump altitudes and deploying a parachute at a proper height above the ground. It might be best to just explain the airdrop process itself. WE flew into the valley well above the mountain tops (Again, I cannot give better estimates on altitudes without some help from better maps and an experienced rigger or two.) We were a silver colored Air America DHC-4 Caribou flying quite high so the NVA would have pretty much ignored us. Officially, although we had been fired upon before, we were non-armed, non-combatants. They probably figured we were just on our way to someplace that took us across this battle area and would not have wanted to waste valuable ammunition on us. I should point out another difficulty we had to overcome was the fact this was the first and last time I was in the sky above Thuong Duc. The crew and I had to compute everything from our topographic maps (detailed maps used by the military) which were based upon old French maps and were notoriously incorrect. They sometimes showed mountains were there were valleys and vise-versa. The big thing we would have needed to know was the elevations of the runway and the mountain tops. This is the only way I could have figured at what altitude we would have had to be at for the drop which would have put us above the ridge line, and the amount of time delay I would have needed for the main chutes to open at, say, 500 feet above the runway. I was looking down out the starboard (right-hand) door giving corrections to the kicker who was relaying them to the pilot. Like me, neither of them had any experience in what we were doing. This was like a sport jump for me and I was looking for the spot. We had only a slight idea what the wind was doing on the ground as the pilot was talking with the A-Team. But we were above the mountain ridges and it was anybody's guess as to what the wind conditions were between us and the ground The pallets had been released from their tie-downs and were just sitting on the conveyor. Using the WAG system (Wild A** Guess - which is what, later, got me through college.) and a little intuition, I gave the kicker the thumbs up. And he notified the pilot over the comm system. The pilot nosed the aircraft up enough to cause the pallets to roll down the conveyor and off the ramp. In other words, no extraction chutes were needed. As each pallet dropped, its static line deployed the load's drogue. Without the drogue, when/if the main chutes deployed, they would tangle with the load and it would burn in. The next step took the use of what riggers called a reefing line cutter. Trying to remember back, there were two cutters with different time delays. I believe the cutter I used had a 10 second delay. When the drogue deployed, it pulled the pin on the cutter (much like a hand grenade.) The line attaching the drogue to the load passed through the hole in the cutter. Ten (?) seconds after being armed, the cutter fired, cutting the line and releasing the drogue which was also connected to the main cargo chute. The drogue became the air anchor for the main cargo chute and each main chute deployed as planned. Again, at this time I have no way to estimate the height above the ground these chutes deployed. But the idea with cargo is to keep it low so that it doesn't drift too far. As soon as we dropped our load, the pilot made a very tight U-turn to port (left). After my attention was released from my magnificent feat, I noticed these golf ball size globs of light coming up and arching not three feet below me. That's below, directly below, me!!! Not below the center of the aircraft - below ME. Of course, we were at full steam ahead and soon outranged our would be despoilers. Our mission was a complete success. One of the weird things about Nam was that things like this were just no big deal. Just another day at work. No attaboys or "Nice job." or pats on the back. I can't be sure now if anyone outside my Vietnamese laborers and the Air America crew knew how we got the rice into Thuong Duc. I'm sure the guys there were too busy bobbing and weaving trying not to get shot or mortared to notice how the rice got there (unless, as I said above, The pilot was in radio contact, in which case I would have to have been given the team's call sign and frequency. It was normal practice, when I delivered loads to the A-camps, to contact the team so they could meet us with a truck. One never wanted to be sitting on a runway too long!) They might have abandoned the camp with the rice still sitting there. I think back now and feel someone should have taken note. If it worked for me, Air America and rice, the Air Force should have been able to drop all kinds of supplies the same way but better. I've tried to find out about high altitude, free-fall cargo drops from a couple of quartermaster and rigger websites. Note: After rigger school, I was assigned to a supply depot with job of inspecting new equipment used by the airborne. I spent the rest of my first enlistment there. We didn't do airdrops or pack thousands of chutes like the riggers in normal airborne units. After re-enlisting, I left the depot and, except as a FAA licensed civilian rigger, moved on with my Army career as an NCO trained in operations and intelligence in Special Forces and service in Vietnam. Update 11 Feb 11: I've just lost my bragging rights. 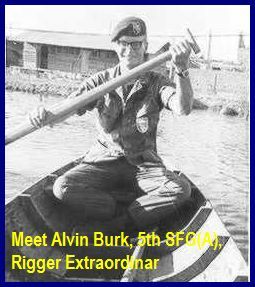 I've been informed by a former 5th SFG(A) rigger, Alvin Burk, that the 109th Qm Co (AD) made a radar guided high altitude drop in '67. This brings up a disturbing point. Lack of communication! The Air Force in DaNang refused to even re-supply the besieged camp with ammo. Obviously, they were unaware of the 109th's accomplishment. Consequently, in 1968, I risked my life and the lives of 3 friends because of lack of communication. How many lives were actually lost in Nam due to this problem? The entire camp could have been over-run with all souls lost because the Air Force was not aware of this tested technique and it would have been the Air Force that flew that radar guided air drop. Rather then delete my misrepresetions, I've struck them out. It's a false belief I've held for 43 years. I do still have 2 acomplishments left. I hit the runway without radar. And I jury rigged my drop by myself and without prior knowledge of of how to do it. WARNING: When you seek the truth, you just might find it. Integrity is a heavy burden to bear. It was 1968, near DaNang. A United States Army Special Forces A-Camp had been under siege for some time. The Air Force would no longer fly into the besieged valley because the NVA had their anti-aircraft weapons set up on the mountain ridges. All supplies were running low, but they had been out of food for a couple of days. My OIC (Officer In Charge), CPT Warren Orr, called me into his office and ask me if I thought I could deliver 5,000 pounds of rice to Thuong Duc using my friends from Air America. A high altitude air drop into a besieged Special Forces A-Camp.